Last week’s guest speaker was Kizito Lubuukwa. Kizito not only came himself, but brought along his wife, Kevina and their six children, which added a quite unique flavour to our club meeting. 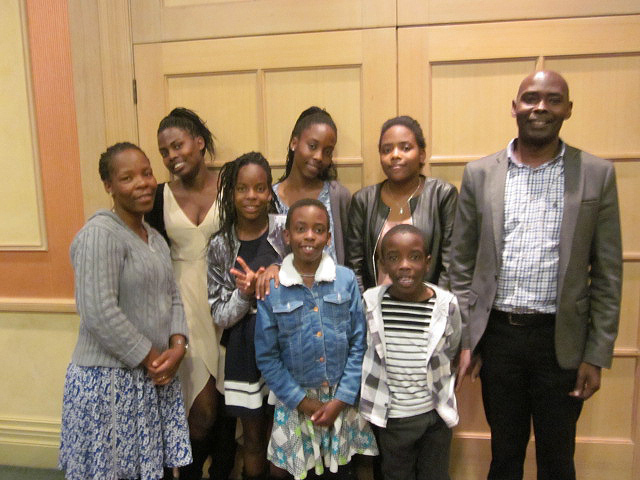 Kizito and his family came to Australia from Uganda in 2013. He and his wife have university degrees and Kevina wished to undertake a PhD degree at an overseas university. She applied to a number of universities, including Cambridge, but it was UTAS which responded and offered her a place. Kizito said that he and Kevina travelled to Tasmania with their two youngest children, not really knowing where they were going or what they might expect on arrival. The four oldest children were placed in a boarding school and were not told that their parents and two younger siblings were moving overseas, as it was felt that this might be too distressing for them. Kizito explained that Africans belong to a clan or tribe which is generally represented by an animal. His clan’s animal is an antelope. His five girls have names beginning with the letter ‘N’ indicating their tribe and the fact that they are girls. Their names are Nakateete, Nakaddu, Nakkungu, Nabelolo and Nadbabino. The youngest child is a boy—J. Victor Mugumbe. Kizito said that their initial reaction on arriving in Tasmania was one of culture-shock. In Uganda, community consists of grandparents, village parents and extended families—all with closely shared links. They found that those links were absent in Tasmania. However, a number of individual people reached out to them and helped them greatly in transitioning to their new life here—helping them find housing, schools, medical care, employment, warm clothes etc. They were also given a TV and lent a car. They arrived in summer temperatures, which they were used to, but then winter came, and being cold was a new experience for them. Encountering airconditioned buildings in summer was also a new experience. They also had to adjust to the time difference between Uganda and Australia and also to Australian food—there was plenty of it—too much in fact, but not the food they were used to. Kizito was able eventually to get a job in a retail store, but found selling unfamiliar merchandise and using unfamiliar currency a challenge. His employer was understanding and gave him a second chance to cope with the employment demands. A kind friend gave Kizito a loan and this enabled him to travel back to Uganda and bring the rest of the family to Tasmania. They were given a cat, which they loved. Ugandans don’t have domestic pets. Unfortunately the cat ran way. Kizito said that the family, although they miss Uganda, are very happy here and have made many friends. Kevina lectures at a Ugandan university via Skype and they are now supporting projects in their home country. Our outbound Youth Exchange student Lucy Rivers is living the dream. 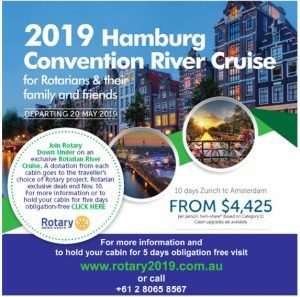 RYLA – Rotary Youth Leadership Awards.